1. Push the cuticles back and prep the nails with the buffer side of the Beautiful Nails Shaper file to remove the shine and oils from the nails. 2. Apply Peace Nail Prep to dehydrate the nails. 3. Apply Love primer to promote adhesion. 5. 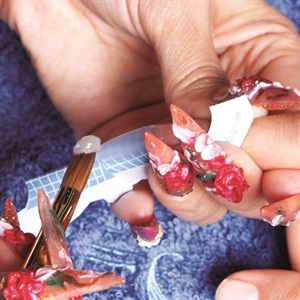 Apply Beautiful Nails Clear Acrylic with the #10 Beautiful Nails Sculpting Brush to build a thin free edge to lengthen the nail, pressing a small amount onto the end of the nail plate. 6. 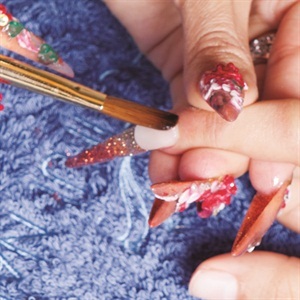 Apply Crystal Mojo to the acrylic on the center of the nail and sprinkle glitter dust by tapping the container with a file. Let dry. 7. Overlay the entire nail with Clear Acrylic and shape with the Beautiful Nails Shaper File and finish the surface with the Kupa UP2G Electric File and a medium carbide bit. 8. Build 3-D nail art designs using Beautiful Nails 3-D Acrylic Fall Color Collection, with the Beautiful Nails 3-D Sculpting Brush. Finish off with UV Phoria Top Gel and cure for two minutes. For more information, go to www.kupainc.com.